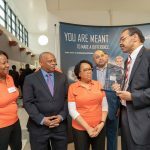 An event presented by Lockheed Martin Corporation brought 300 Morgan State University students to MSU’s Clarence M. Mitchell Jr. School of Engineering (SOE) earlier this year for job opportunities; mentoring; career coaching and advisement; and exposure to cutting-edge industrial technologies. The student participants in the Lockheed Martin Corporation Career Day and Technology Showcase — from the SOE; the School of Business and Management; and the School of Computer, Mathematical and Natural Sciences — engaged with more than 30 Lockheed Martin employees at the Showcase, among them Rainia Washington (MSU’s executive sponsor), vice president for Global Diversity and Inclusion; Woody Woodyard (MSU’s deputy executive sponsor), vice president for Communications in the Sikorsky Aircraft division; and representatives from Lockheed Martin’s Rotary and Mission Systems; Missiles and Fire Control; Space; Aeronautics and Enterprise Operations organizations. Several of Lockheed Martin’s interactive and virtual reality (VR) technologies were featured at the event. The F-35 Cockpit Simulator gave Morgan students hands-on experience with the training that military pilots receive before flying the actual aircraft. The VR “Planebuilder” system enabled students to assemble parts of a plane then fly the aircraft in an interactive targeting game. 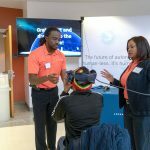 Using Lockheed Martin’s Augmented Reality Tour Experience (ARTE) program, students were able to enjoy interactive, 3-D and augmented reality experiences with a variety of Sikorsky aircraft. 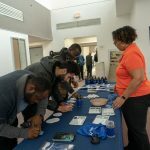 Student participants commented that their exposure to Lockheed Martin technologies gave them a better appreciation of their classroom learning and a better understanding of the technology talent needed for employment with the company. 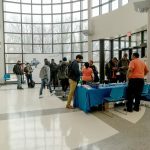 Lockheed Martin hiring managers at the Career Day and Technology Showcase recruited Morgan students to fill jobs in engineering research, computing technology, bioengineering, computer science, accounting, finance, supply-chain management and information systems. Candidates for Lockheed Martin’s “Second Year and Beyond Student Career Work Experience” were also sought. 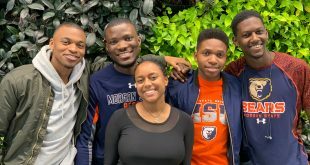 In that program, students are selected at the end of their freshman year and are offered internships and job availability, with rotations through various Lockheed Martin business units for their entire academic career. MSU faculty and staff collaborated with the Lockheed Martin team members on site during the Showcase as well, to develop mutually beneficial research and academic programs and plans. Craig J. Scott, Ph.D., interim dean of the SOE, thanked the Lockheed Martin representatives for investing their time in the event and for their ongoing commitment to supporting the educational and research capabilities of Morgan. SOE Dean Emeritus Eugene M. Deloatch, Ph.D., was also on hand to reiterate the school’s commitment to its longstanding partnership with Lockheed Martin Corporation. 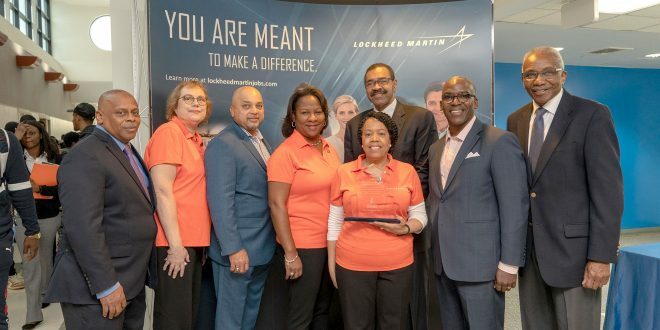 Another highlight of the event was the presentation of an Appreciation Award to Beverly A. Walker, Lockheed Martin’s campus relations manager at MSU. The award acknowledged her seven years of outstanding service and dedication to SOE students by helping prepare them for the workforce, and for her part in greatly increasing the number of SOE students hired by Lockheed Martin.